My desire is to warm your heart and bring a smile to your face with painted rocks. I have always loved nature, walking, and discovering the unexpected in a piece of art. Rock painting has enabled me to combine these interests to create one-of-a-kind, endearing artwork for you. Like so many people today, I'm an enthusiastic believer in simple, natural, economical living - rock painting allows me to recycle an ordinary item into something extraordinary. Watch these videos to see how I transformed rocks and stones into endearing painted rocks in 2015 and 2014. What can you do with a painted rock? Display as a unique art object at your workplace, in your home, or in your garden. Brighten the day of a nursing home resident or hospital patient with a pocket rock. Impress your grade school buddies on “show and tell” day. Hold and look at it from all angles — you'll smile because it’s hard to believe it’s a rock. 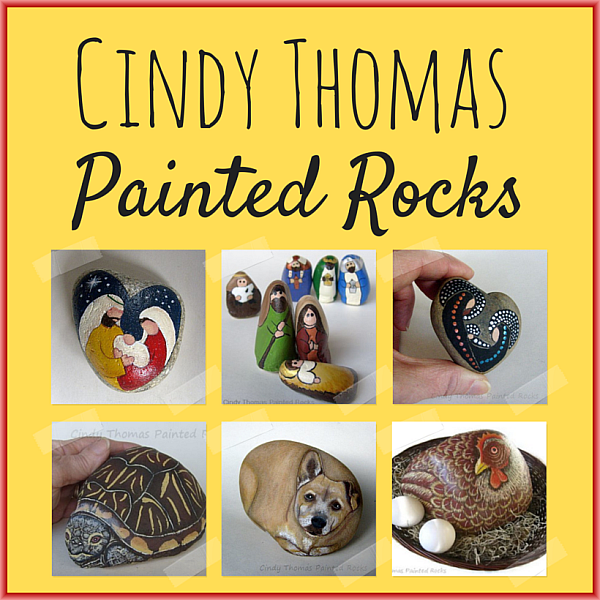 What are others saying about Cindy's painted rocks? What's the process for painting your rocks? The first step is a search for a suitable rock. Sometimes I know the shape I’m looking for and want to paint, other times the rock suggests the subject matter. 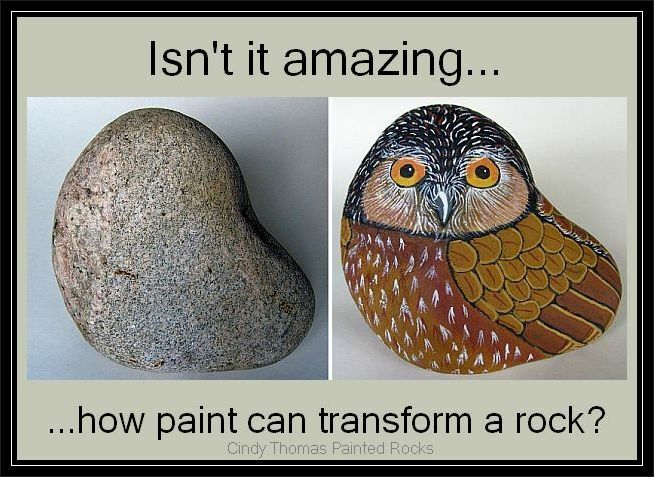 As each color of acrylic paint is added, the rock begins to develop a personality and eventually becomes a unique piece of art that rocks. One to two coats of a sealant is applied to protect the colors and extend the life of the hand-painted rock. Painted rocks can weigh a few ounces and fit into your pocket; larger painted rocks weigh several pounds and are best displayed in a semi-permanent location. From this website, you can see my painted rocks for sale, Amazon Kindle rock painting how-to ebooks, Facebook page, Pinterest boards, rock painting blog, unique nativities painted on rocks, Flikr gallery of Cindy's painted rocks and High Plains Critters website.